Self-appointed head of the "Twilight Disciplinary Committee." The leader of Twilight Town's Disciplinary Committee and self-proclaimed "protector of the town." "Destiny... In that case, let's be friends. I don't feel like cooperating with destiny." Seifer is a minor character in Kingdom Hearts II, who resides in Twilight Town. He is the leader of the Twilight Town Disciplinary Committee, composed of his friends Fuu, Rai, and Vivi. He shares a rivalry with Hayner and his gang, and often picks fights with them. He originally appeared in Final Fantasy VIII. Seifer is briefly mentioned by Pence, who claims that Hayner is upset because Seifer beat his record at Grandstander. Seifer is the leader of the Simulated Twilight Town's Disciplinary Committee, and becomes a rival of Roxas. When Dusks invade the simulation and steal photos of Roxas from around the town, Seifer accuses Roxas as the thief, and the two have a brief duel in the sandlot. Two days later, Seifer and his gang help Roxas fight off several Dusks, and claim their victory when the creatures vanish. During the Struggle Tournament, Seifer makes it to the semi-finals, and competes against Vivi. When Vivi manages to defeat him, Seifer realizes that it is not really his friend, and advises Roxas to "thrash him." While on Sunset Hill, he confronts Roxas's group. He wonders why looking at Roxas ticks him off. Roxas posits that it's destiny, to which Seifer sarcastically replies that they should be friends, as he does not want to cooperate with destiny. In the real Twilight Town, Seifer is the current standing Struggle champion. Coinciding with Sora's return visit to the town, Seifer and his gang are set upon by Dusks. Unable to harm them, Seifer, Rai, and Fuu are knocked unconscious while Vivi runs for help. After Sora, Donald, and Goofy defeat the Nobodies, Seifer awakens and orders Sora to leave town, blaming him for causing trouble. However, he stops Sora before he can leave the sandlot and gives him the Struggle Trophy, honoring him as the strongest person in town. Some time later, he is seen competing in the Struggle again, this time against Hayner. Although Seifer is absent from Twilight Town, his name is alluded to by a few of the townsfolk. Reportedly, he has departed on a "warrior's journey" with Fuu and Rai. Seifer is a muscular teenage boy with blonde hair and blue-green eyes, bearing a distinctive diagonal scar across the bridge of his nose. He wears a blue crop-top vest with white lining under a floor-length, sleeveless white coat with a black lapel. He has baggy, aubergine pants belted with a cream-colored lace, which he tucks into black combat boots with light blue laces. His hair is barely visible beneath a black tuque with the "Ore" kanji (which is a distinctly masculine and sometimes vulgar way of referring to oneself; the backwards kanji also stands for battle). Seifer outwardly appears to be very brash, rude, taunting and sarcastic. He is the self-proclaimed protector of order in Twilight Town, deciding for himself who is out of line and ready to pick a fight to make his point. However, though he often acts like a bully, he is shown to truly care about his town, and can show respect to strangers when he sees fit. His digital incarnation even shows altruism toward his rivals, offering to help Roxas and his gang finish their summer report. Seifer Almasy is a classmate of Squall Leonhart in Final Fantasy VIII, as well as his chief rival. 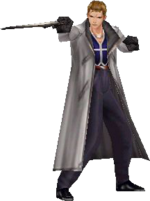 Like Squall, Seifer is one of very few people to wield a Gunblade, his model called the Hyperion. Leader of the Balamb Garden Disciplinary Committee, he is close friends with fellow students Raijin and Fujin. Seifer originally trains to become a SeeD member alongside Squall, but is unable to make the cut due to his rash attitude and rebellious nature. He later becomes a regular antagonist/anti-hero after being swayed by the main antagonist, the Sorceress known as Ultimecia, as it is his "romantic dream" to become a Sorceress's Knight. However, he later realizes his wrongdoings and redeems himself. 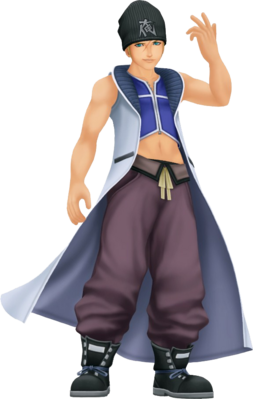 Seifer's derogatory nickname for Zell Dincht ("chicken wuss") is used in Kingdom Hearts II as his nickname for Roxas, and his position as the head of Twilight Town's Disciplinary Committee reflects his Final Fantasy counterpart being the head of the Balamb Garden Disciplinary Committee. During the Struggle, Seifer's battle stance pays homage to his stance with his Gunblade. Although he and Squall are enemies in their original game, they never meet or even see each other in the Kingdom Hearts series, despite retaining the scars they gave each other.